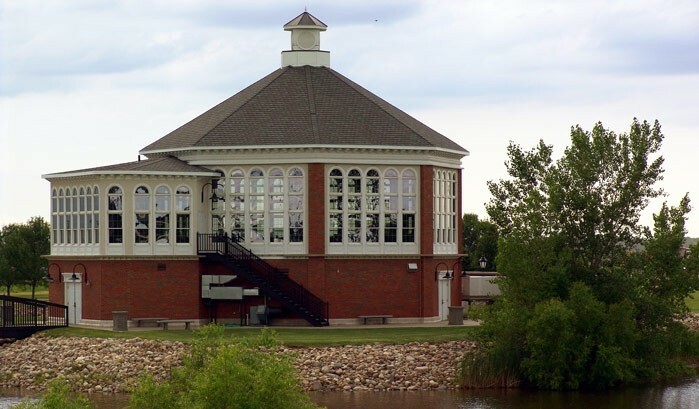 Beautifully placed in the center of the Park where the waterways meet sits the Redlin Pavilion. This octagonal structure, with its architectural symmetry, serves as sculpture for the surrounding landscape. With seating for up to 120 guests, its interior is elegantly finished with granite floors, a breathtaking chandelier, and floor to ceiling windows showcasing stunning views of nature and wildlife. The Redlin Pavilion is a majestic setting for any event. Amenities include a catering kitchen, outdoor patio, sound system, and ample parking. Call 605-882-3877 today to book this one of a kind facility for your once in a lifetime event. The Pavilion was designed by Charles Redlin to feature his father’s America the Beautiful collection. Each peak in the octagonal ceiling features a larger than life, illuminated panel from the series. Stand in the center beneath the chandelier and sing along as the artwork leads you through the first verse of the patriotic song. Explore the America the Beautiful series in the Collection. Call us toll-free at 1-877-873-3546 or contact us online to book your special event.